CPAA has branches at Delhi and Pune, each strives to achieve the common CPAA objective of Total Management of Cancer as a disease. The Delhi Branch was started in 1979. The activities were kicked-off in partnership with the Rotary Club at the Rotary Cancer Hospital. Today these activities have been extended to the All India Institute of Medical Sciences (AIIMS), Loknayak Jayprakash Narayan (LNJP) and Safdarjung Hospitals. 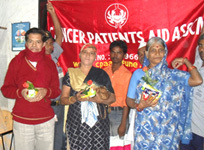 At these three centres, CPAA provides medical aid, food, toys, books and counseling to cancer patients. Patients from New Delhi, NCR and the Northern and Eastern states of India have been provided assistance over the years. Mrs. Kiran Hukku, Director of New Delhi branch was felicitated in 2014 for CPAA's exemplary work in the field of Breast Cancer at All India Institute of Medical Sciences (AIIMS), New Delhi. She was presented with a trophy by Dr. Jaipal Reddy, Hon. Minister for Science & Technology and Ministry of Earth Sciences; at the kickoff event for the 'Pink Chain' campaign. 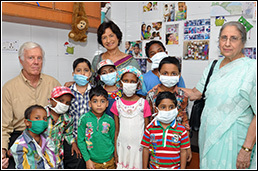 Several childhood cancer patients undergoing treatment at All India Institute of Medical Sciences (AIIMS) are adopted by the Global Charity Foundation (GCF), USA through CPAA's New Delhi branch. As one of our major donors, the mission of GCF is to Improve access to health care and education for those living in rural villages in India. Global Charity Foundation has been supporting CPAA in making treatment possible and saving lives of several childhood cancer patients. Their Founder President Dr. Reeta Thukral and Mr Stacy Standly, an esteemed board member were the special guests for the Diwali party this year. They pledged their unwavering commitment and support to CPAA. It was heartening for them to observe first-hand, the impact of their support towards these families. The patients and care-givers too in turn got the opportunity to express their gratitude towards Dr. Thukral and Mr. Standly. Children thoroughly enjoyed the activities planned for them followed by a hearty festive meal. Patient Care services were rendered from the All India Institute of Medical Sciences (AIIMS). Medicine Disbursement: Medicines such as chemotherapy drugs are disbursed to needy cancer patients referred by AIIMS / LNJP doctors at the out-patient department of the hospital. Special provision has also been made to provide medicines to the patients, in case of emergencies. Recreational Room: The Rajgarhia Dharamshala (AIIMS) houses outstation patients undergoing treatment in the city, along with their care-givers. Thrice a week, CPAA runs various recreational activities for the inmates including yoga, arts and crafts, indoor and outdoor games, singing, dancing, education and lectures on hygiene and cleanliness, nutrition, story-telling, drawing and painting and handicraft. Important festivals and National Days are celebrated with great fervor. Pediatric Oncology: A playroom is managed by CPAA’s social workers at the AIIMS hospital for childhood cancer patients undergoing treatment and their accompanying siblings who are welcome to spend time here. Games and toys are made available to keep them in a happy and stress free environment. The social workers try and involve the children in simple activities like craft, games, reading, etc. Special activities are organised on Rose Day, Diwali, Christmas and other important days / festivals. Every Wednesday juices and bread buns are distributed to patients coming to the Day Care Unit from the wards. 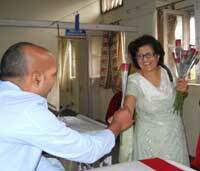 Breast Cancer Support: CPAA social workers visit patients who have undergone surgery for breast cancer, in AIIMS. Along with counseling, they are informed about post surgery care and precautions, chemotherapy, diet and nutrition, etc. Guided by CPAA’s Total Management philosophy, the Delhi branch completed two years of their initiative of Breast Cancer Support Group. To keep the momentum generated by this initiative, efforts are made to hold meetings once in two months. Shuttle Service: CPAA Delhi runs a shuttle service thrice a week to bring patients and their families from Dharamshala to AIIMS. Around 1,350 persons benefit from the service during the year. Ration Distribution: Food rations are distributed AIIMS and other hospices every month, supporting patients and their families who come from out of town. Cancer Awareness and Detection: CPAA, Delhi holds health check up and cancer detection camps regularly in Delhi and NCR (National Capital Region of India). A mammogram van from Medanta Hospital is also present at camps for women where suspect cases are offered and instant mammogram on-site. Awareness lectures are conducted at schools, colleges and corporates by our panel doctors. However the main focus remains on under privileged areas. Suggestions in the interest of the patients care. Sponsorship for patient oriented events viz; Holi, Diwali and Christmas celebrations. Giving space for our Rehabilitation/diagnostic center. 'We are concerned with improving the quality of life if not the span of life, ' remarked Ms. Kiran Hukku. If you would like to contact CPAA’s Delhi branch, click here. Pune branch was started in 1995 with the help of doctors from Inlaks and Buddhrani Hospital. Over the years we have extended our reach to other hospital like Sasoon, Ruby Hall Clinic, Jehangir Hospital, Deenanath Mangeshkar Hospital, Cipla Palliative Care unit, Command Hospital, Sahyadri Hospital, Y.C.M. Hospital, Sahara Hospital and Bharti Hospital. Medicine disbursement: Chemotherapy Drugs are distributed to poor, needy cancer patients undergoing treatment at the above hospitals. Special provisions are made for special investigation for deserving patients. Make a Cancer Patient Smile: Programmes are arranged to keep patients in their positive state of mind. This would help them to forget their pain for few hours. Programmes are also conducted at hospital for in-patients like singing, painting and magic shows etc. Cancer Patients Aid Association staff counsel patients who have undergone surgeries they are informed about post surgery care and precautions about chemotherapy, radiation, diet and nutrition. B. Ration Distribution: Every month ration consisting of food-grains, dry fruits and nutritional food supplements are distributed to patients. 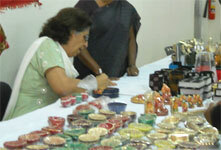 Toys, clothes, towels, shawls and utensils are distributed at festivals and special events. C. Cancer Awareness and Detection: CPAA Pune branch holds detection camps regularly in and around Pune region. These camps are held at hospitals or at different venues like factories, bus depots, villages etc. Suspected cases are referred for further tests and investigations. Awareness lectures are also conducted at corporates, villages, self help groups, municipal workers and in the slums. D. Transport services are offered to patients to and from different hospitals. E. Events Calendar: The events observed and celebrated in 2011 were World Cancer Day, International women’s day, World no Tobacco day (WNTD), Rose Day, Brest Cancer Month, Diwali and Christmas. These programs provide the much needed relief and emotional support to the patients and their relatives. Several Celebrities from the movie world, cricket, have given their support during World No Tobacco Day and Rose Day by attending our events and mingling with Cancer patients. Notable among Bollywoods stars are Deven Verma, Kader Khan, Moon Moon Sen, Sonali Kulkarni, John Abrahim, Mukesh Khanna the ‘Shaktiman’, Vrijesh Hirji, Pooja Bedi, Criketer Hrishikesh Kanitkar, Smruti Irani and many more. Hamaari Baaten: A newsletter called ‘Hamaari Baatein’ is published bi-monthly which covers the activities, latest news and articles of interest. Today Cancer Patients Aid Association’s Pune branch has the support of a number of companies and individuals.